A demonstration of the Copter Combo. The Copter Combo, known as the Flight Combination (フライトコンビネーション Furaitokonbinēshon) in Japan, is a move performed by Sonic the Hedgehog and Miles "Tails" Prower together in Sonic the Hedgehog 4: Episode II. It is a Tag Action performed while jumping, allowing Tails to carry Sonic while flying much like in the classic games. 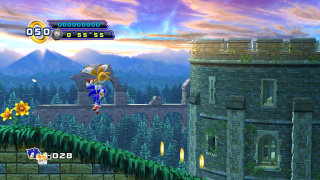 Once the player has reached a certain point in Sylvania Castle Zone Act 1, the player can press / while jumping to make Tails start carrying Sonic, then fly across distances or to high places. Unlike flying in the classic games, Tails does not get tired from flying too long, but instead gets tired after the player has pressed the jump button seven times. The player can cancel the move at any time by pressing the Tag Action button again. The player can attack enemies while using this move by flying directly underneath them. When using this Tag Action in Multiplayer mode, Tails' movement is controlled by Tails' player. If Sonic's player presses the Jump button, he will jump off Tails' hands, and both players can cancel the move by either pressing the Tag Action button or letting Sonic simply drop from Tails' hands. Like other Tag Actions, this move will cancel Super Sonic when used. This page was last edited on 28 June 2018, at 09:32.